Last week, I posted about LUSH's new Emotional Brilliance makeup line and reviewing their Grease Lightning blemish treatment, This week, I'm still on a pretty LUSH-happy kick thanks to their Happy Feet pedicure kit ($24.95). The bundle of four tootsie-pampering products helps you soak, scrub, exfoliate, and moisturize your way to softer feet before your DIY pedi. Plus, all the products come bundled in a reusable knotted cloth--an eco-friendly packaging method based on a centuries-old Japanese tradition of wrapping gifts in reusable patterned cloths. So how did all the products in Happy Feet fare? Let's take a look at each one. 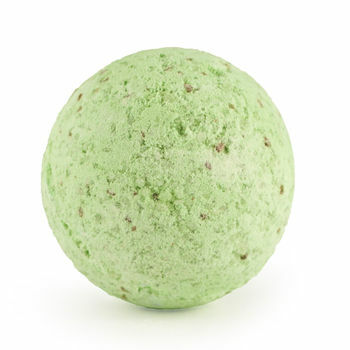 The Geo Phyzz bath bomb is classic LUSH: a fizzy orb meant to be dropped in a bathtub filled with warm water. The sea salt, cypress, and pine made for a relaxing soak, but I wish that LUSH had included 2-3 smaller versions of Geo Phyzz in Happy Feet instead of just one big bath bomb to allow for multiple soaks. 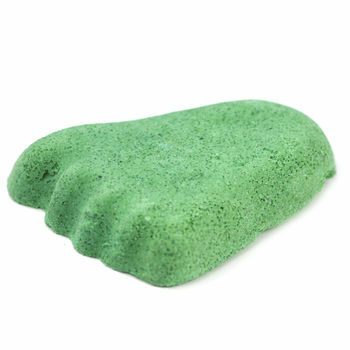 The Stepping Stone foot scrub dissolved too quickly to be of much use as a scrubbing stone, plus its bright green colour and oily residue were a bit hard to clean from my nice white bathtub! Not a fan. Of all the products in Happy Feet, I was most intrigued by the Volcano foot mask, which is supposed to exfoliate dead skin using papaya enzymes and deodorize at the same time. Simply apply, wrap your feet in cling wrap, and wait 10 minutes before rinsing. After I finally managed to get the super-tight lid off, I applied the cement-like mask and wrapped my feet as instructed. A warm tingly sensation washed over my feet as soon as the cling wrap was on. (The enzymes, I suppose.) Calluses and dry spots were noticeably softer when it was time to rinse off. 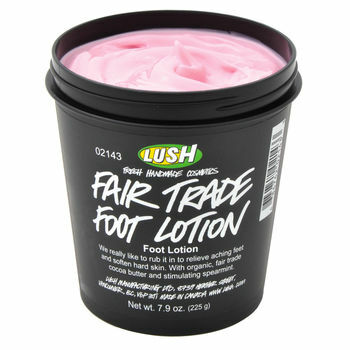 Like the Volcano foot mask, the Fair Trade foot lotion--infused with arnica and mint--was a Happy Feet highlight. The refreshing, quick-absorbing, and super-moisturizing formula contains organic fair trade cocoa butter. I've taken to keeping it in my nightstand and applying a bit before bed. Overall, I like the premise behind Happy Feet. But if I had to choose, the Volcano foot mask and the Fair Trade foot lotion would be my favourites. Have you tried Happy Feet or any of the products in it? Feet can take such a beating when walking around all day cramped inside impractical flats and heels. 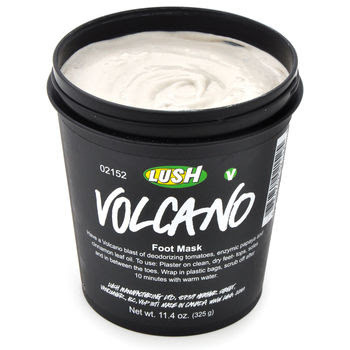 I've always loved the way Lush products smell and I might have to swing by and look at the Volcano foot mask (providing I can get over the cling wrap thing haha). p.s. David & I definitely want to hang out with you and Lawrence, but our weekends have been packed. We will be free soon, before the weather turns, though! I haven't tried any of these products, but based on your experience the last two sound like a good bet! I would like to try the Volcano foot mask and I agree that the bath bomb would be better in smaller bombs. The bombs are a perfect size for baths, not a foot bath.